"Since 2016, we have seen a modest overall annual growth in participation of about 1-5 per cent over the past two years," says Phil Dale, the Executive Director of Triathlon Ontario. There was a time, not too long ago, when triathlon and multisport growth was in the red. “Triathlon participation in Ontario started to decline between 5-10 per cent annually in the 2013 season and lasted through to 2016,” says Phil Dale, Executive Director of Triathlon Ontario. The swim at Multisport Canada Niagara Falls Barrelman. Photo: Brad Reiter. From 2008 to 2012, it was Simon Whitfield’s and Paula Findlay’s success that drove interest from the general public and corporate sponsors. “For example, CBC broadcasted an ITU WTS (International Triathlon Union World Triathlon Series) race pretty much every weekend during the season, but that ended after the London Olympics,” says Dale. “There was also the rise of pseudo endurance events like Tough Mudder that gave people another option for a bucket list experience,” says Dale. Coverage and Interest: The 2016 Rio Olympics likely gave a boost. Success and Excitement: In 2018, Joanna Brown won bronze at the Commonwealth Games and Tyler Mislawchuk had a breakout season on the ITU circuit – finishing the year ranked 10th in the world. There’s also a lot of world-class potential in the U23 and junior divisions. Not to mention Canada’s long course success on the men’s and women’s side. Coverage and Interest: In 2018, CBC streamed the World Triathlon Series online and Facebook started streaming Ironman races on IRONMAN now Facebook page. 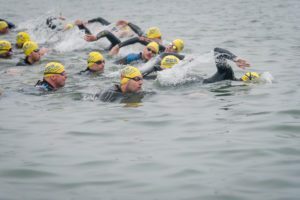 Spectator friendly: The introduction of professional and age group super sprint triathlon series’ – Major League Triathlon and Super League Triathlon, are super-fast and help make triathlons more spectator friendly. Variety: A variety of events have been included in triathlon race weekends – try-a-tri, tri and duathlon team relays, aquathlon, aquabike, swim-run, duathlon and cross, sprint, Olympic, long course, 70.3 and full triathlon races. It’s important to realize triathlon isn’t the only multisport event. “If you’re willing to look outside the box, there are some great events out there that won’t take all day and break your budget,” says Daniel Clarke, TMC contributor and professional triathlete. What can you do in the winter? New to triathlon? Are you looking to stay sharp over the winter? Then, an indoor triathlon is for you. “Indoor tri’s are an awesome workout – they last 45-60 minutes, and they’ll really get your heart rate going,” says Clarke.